Midleton Island is a small Island in the Gulf of Alaska. It lies almost due south of Cordova, Alaska, near the continental shelf. Middleton Island is 70 miles from the Alaska mainland, and 50 miles from the nearest island The Island is approximately 4 1/2 miles long and 1 mile wide at the widest point. There is about 2200 acres on the island. Middleton Island is oriented roughly parallel to the magnetic north-south line at a latitude of 59.0 degrees 26" north and a longitude of 146.20 0" west approximately. Its comparitively low grass covered surface is difficult to pick up when trying to make a landfall. From a few miles offshore the island appears flat. A pinnacle rock at rhe extreme southern end is aspicuous from either an eastwardly or westwardly direction. The waters westward of the island are clear of off lying dangers, giving an easy approach to the only safe anchorage from this direction. This anchorage is about 1.2 miles from the middle of the island in 10 to 12 fathoms of water. This area provides the best shelter from the prevailing eastwardly gales. The best landing place is in the bight on the western side. At low water , the shore 100 yards from this spot is calm due to the protection of a small gravel spit of land which bares at low tide. About 4 miles, 450 degrees from the northern end of the island lies another rock. This rock breaks only in rough weather. It is in 4 fathoms of water, although shallower water may be found. Fountain Rock and the area surrounding it should also be given a wide berth. A landing on Middleton Island is accomplished only by going through the surf and breakers in a small boat. This is hazardous because of the shoal water surrounding the island and the lack of a sheltered harbor. The remains of the S.S,. Colebrook . and a small fishing boat, which are visible from the island, attest the inhospitality of the adjacent waters to marine traffic. The island bedrock is composed mainly moderately indurated marine glacial sediments, deposited during the late Centozoic era. It has been tilted to the northwest and later planed off by the waves. Many large foreign boulders, up to 10 feet in diameter , were deposited on the initial wave-cut bedrock during the Pleistocene time , either by large icebergs , or by a glacier that formed an ice shelf along the present shore of the main land and extended some 70 miles to the south. The bedrock contains rounded to angular rock fragments, and deposits of clay, sand, silt and gravel. These deposits overlying the bedrock represent a predominately residual materiel derived from waves more than 30 feet in thickness. The bedrock itself can best be described as a massive "conglomoratic sand mudstone" and it contains large inclusions of marine fossils. After a long period of submergence, the island was elevated by a series of pulsations, thereby allowing for the five distinct terraces, ranging from 10 to 105 feet in height. These terraces are the most stricking feature on the surface of Middleton Island. Located on top of the highest terrace are several rows of conical mounds. 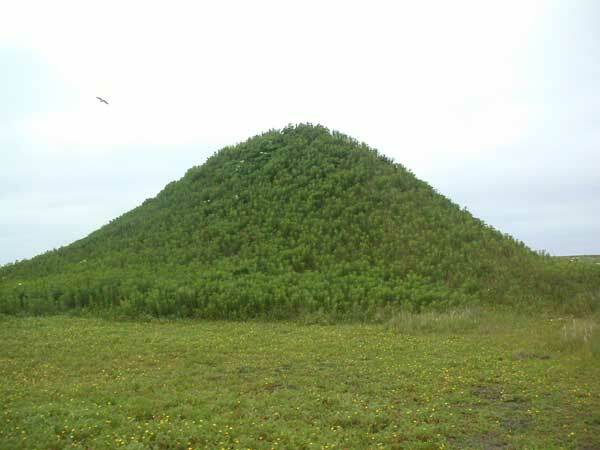 The mounds rise above the general level of the highest terrace to a height of 20 feet, bringing the altitude of the island to a maximum 126 feet above sea level. The lower terraces, 10 to 45 feet slope off gradually near the north end of the island, merging into the present beach. , and an area of irregular sand dunes. A low spit of sand and gravel form the north end of the island. Steep cliffs undergoing rapid erosion, forms the high tide shore line around much of the island. The cliffs range from 10 to 45 feet at the east and southeast shore, to the maximum height of 110 feet as it intersects successively the higher 65, 85 and 105 foot terraces. Geologisr, using sea bottom cores from several localities, believe that Middleton island represents 4,500,000 years. Middleton Island has a maritime climate with maritime temperatures. The lowest recorded temperature was minus 5 degrees F. in February of 1956, The highest temperature was 73 degrees. The average temperature for 1956 was 40.3 degrees with the warmest month, August having an average temperature of 53.3 degrees. The long term mean temperature is 42.1 degrees. Precipitation averages 61.48 inches, although in 1956, the total rainfall was 51.4 inches, a departure of 10 inches from the long term mean. High winds are common, especially during the colder months. During the winter the prevailing wind direction is mainly north and east. While in the summer, the winds come from the southeast. The highest recorded wind speed was 72 mph with gusts estimated up to 135 mph. The following Climatological Survey 1950-56 is factual and reliable for that period. greatest rainfall in 24 hours............5.4 "
greatest snowfall in 24 hours...........9.0 "
Middleton Island, at one time was inhabited by indians belonging to the Chugatches Tribe. The indians were friendly but for some unknown reason, they turned hostile. During the early 1700's, Gerrossin G. Ismailof, a Russion, set sail for what was then called "Achakoo Island". He was under the impression that the island was abound with sea otter. Guided by an indian pilot , Ismailof soon arrived at the island. The ship, being to big to make a landing, was forced to remain in the deep water some distance off shore. A smaller boat was launched with 18 men including the indian. After trading amicably for some time, Ismailof sent a party of 8 men in search of eggs along the cliffs. The men returned quickly reporting that several boats were appoaching the island. Suspicion was heavy over the group of men, and increased greatly when it was noted that the guide was missing. The chief of the arriving indians professed no knowledge of the deserter and offered to go in search of him with 5 Russians. Four of the men were sent into the interior of the island on a false trail, while the chief furiously attacked the fifth. One of the four returned to help his companion, and after a severe struggle, the chief was dispatched with a musket ball. As soon as the others returned, the party hurried aboard their ship, hauled anchor and with all possible speed, departed the island. In 1791 the Spaniards landed on the island, naming it "Isla de Higiso". Henry Middleton was an American Minister to Russia (1820-1830) Mr. Middleton negotiated a treaty with Russia in 1824. This treaty regulated trade and fisheries in the Pacific ocean, and the northeast coast. It also established the line of 50' 40" as the limit of Russian expansion. Since 1890, Middleton Island has been homesteaded by several people although no claim for a homestead has actually been filed. One claim was attempted but it was never completed. Of the several people living on the island was a man and his wife from Boston. Once a year the man and his wife would make the trip to Cordova, Alaska and pick up their supplies. Among the things they picked up were a year of back issues of the Boston Transcript and each morning they would read the paper exactly one year old. It is not known how long they lived on the island. Following the Boston people, two men began a fox farm on the island. The two partners lived on the island for some time. and prospered very well with the Blue fox. Besides the return from the fox pelts, after a particular type of storm the two men scooped up 9 casks of black sand. They shipped this sand to a smelter for which they recieved $900 for the gold that was extracted. Such a windfall occurred only after a certain combination of very high winds and tide. There were no dates as to the length of time these two men were on the island. A man by the name of Thomas Smith, from Maine, followed the two partners. Like many of the easterners, Smith was caught up in the mad rush for gold. He landed in Valdez, Alaska in the Spring of 1898, and set out to make his fortune. Being a man of action, Smith soon had a comfortable living place. The reports coming in from the Valdez Trail were mostly hearsay, but Smith picked enough truth and facts to cause him to hesitate before risking his life in the wilds of Alaska. He was unsure of this risk and it was this uncertainty and it caused Smith to spend five years of his life in complete loneliness. While he was trying to make up his mind, he met a new arrival in Valdez. This new acquaintance let him make up his mind completely. The man was one of the two men that had the first fox farm on Middleton. His partner had died during the winter, and he didn't want to live alone on the island. For this reason, he was willing to sell his rights of the island for a fraction of it's true value. Smith was interested and satisfied with the story of the man, rightly judging him to be honest, and found his proposition appealing. With adverse reports still flowing in from the Valdez Trail, Smith decided to venture into the fox farming business.. He knew the sea and had no fear of the lonely life the enterprise would entail. The deal was soon closed and Thomas Smith became the sole owner of Middleton Island, subject to squatters rights. Smith, knowing he would have to know more than a basic knowledge of fox farming began visiting other fox farms. He sailed to the Naked Islands and Pribily Islands in search of the needed information. The information was given to him freely, and upon his departure for Valdez, he bought several pairs of foxes. It was arranged for the foxes to be sent to Middleton after he had settled down on the island. Upon his arrival in Valdez, Smith set out preparing for the trip to his future home. After looking around for a while he found the boat that he wanted, and gave it a complete overhaul, including a new coat of paint. Then he gathered together a year supply of food and equipment. His only aids to navigation were a compass and a hand drawn map, with the direction of his destination a mere 150 miles away in the vast sea. One day in June, with a fair wind blowing down through the straits, Smith set sail on a voyage never before undertaken under similar circumstances and conditions to a life alone and complete isolation.